Formed in the small Northern Swedish town of Norsjö in late 2003 by vocalist David Nilsson and bassist Viktor Eriksson. 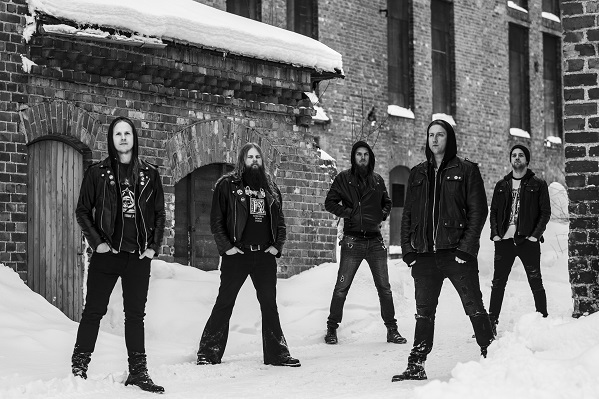 Feral later relocated to the nearby town of Skellefteå and formed a full line-up along with guitarist Petter Nilsson and drummer Rickard Lundmark before eventually rounding out their roster with the addition of guitarist Markus Lindahl. With the lineup complete, the band soon began writing and performing around their native Sweden. Soon thereafter, Feral began recording demos and playing some very high-profile gigs, including a month long European tour with death metal legends Master in February of 2009 and a mini-tour with Six Feet Under in September of the same year. In between these tours, Feral returned to the studio to record the highly acclaimed "Welcome To The Graveyard" demo, which caught the attention of Ibex Moon Records' owner, John McEntee, who signed the band to his label late last year. With this lineup, a firm and strong sound, and all the determination in the world, the group recording their debut full-length, Dragged To The Altar, in 2010 . Which was released on April 26th, 2011 via Ibex Moon Records. The release of the debut album was followed by a European tour along with the Swedish death metal band, Demonical, and supported by Gloria Morti and Arroganz. Writing on the album to follow the debut was begun immediately after returning from the tour. But the recoring of the album was delayed due to line-up changes when Rickard Lundmark and Petter Nilsson left the band to pursue other interest after having recorded the song for "The Deathkult EP", a split EP along with German death metal band, Revel in Flesh, released though Joe Black Records. The band was later joined by ex-Armagedda drummer, Roger Markström, and Markus continued as the sole guitarist and the recording process for the next album could be started. The new album "Where Dead Dreams Dwell" was released in May 2015 though Cyclone Empire followed by the EP/minialbum "From the Mortuary" in December 2016. In July 2017 Feral announced their signing to Transcending Obscurity Records and started work recording their third album soon after having been re-joined by guitarist Sebastian Lejon . "Flesh for Funerals Eternal" was released in late December 2019.